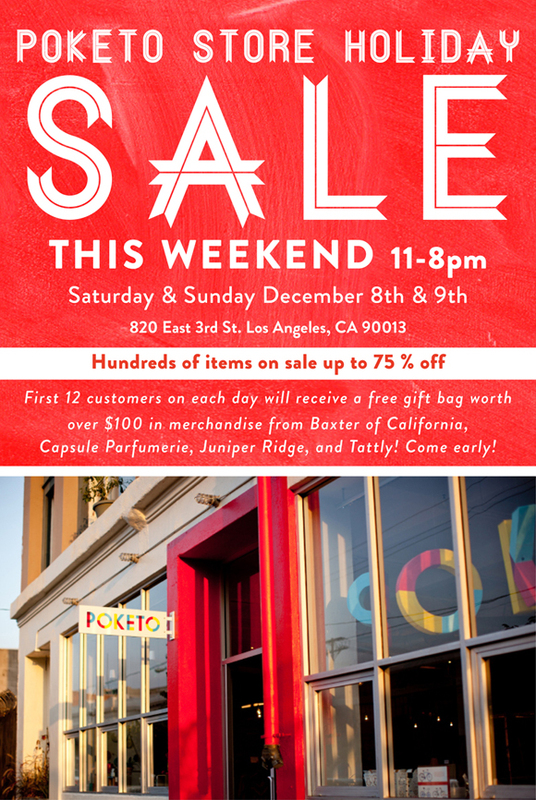 Poketo Annual Holiday Sale is Tomorrow and Sunday! If you have your eye on that super-soft tee or roomy backpack, or have yet to start on your holiday shopping, mark your calendars for Poketo’s long-awaited Annual Holiday Sale Event happening this weekend! • First 12 shoppers each day will receive a gift bag (pictured below) worth over $100 with treats from Poketo, Juniper Ridge, Baxter of California, Tattly, Capsule Parfumerie and Fatima Fazal. It pays to come early! • Up to 75% discount on a wide selection of apparel, accessories, housewares, stationery, and lifestyle goods. • Never-seen-before sample items, and store-only exclusives not available online. • Homemade apple cider and a fresh brew of Handsome Coffee while you shop. For those who have yet to drop by the store, the holiday sale is an excellent time to soak up some festive fun while you shop. We look forward to seeing you at the sale this weekend! Please RSVP here.